TINO is the nickname the architects of Atelier d'architecture Vincent Parreira have given Casarès-Doisneau Intermunicipal School Campus in Saint Denis, a project in which architect Vincent Parreira reinterprets the town’s built heritage and social memory. 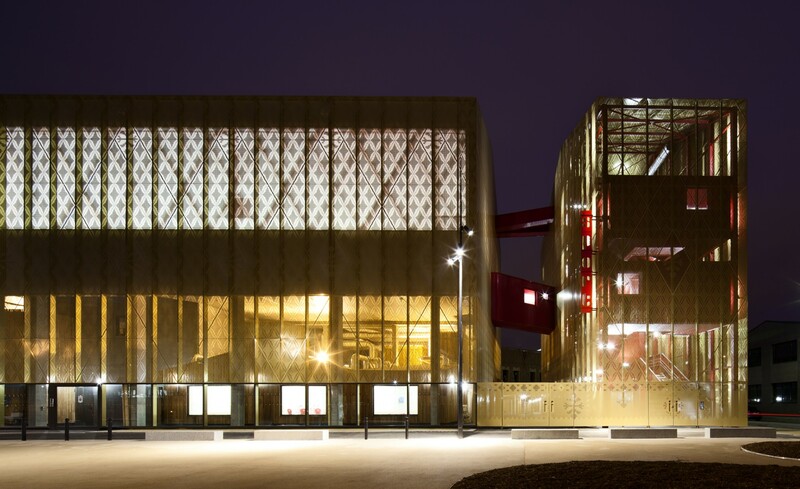 AAVP designed a school campus in Saint Denis, a municipality to the north of Paris. Saint Denis was a polluted industrial city for many years, but the trend has been reversed since the end of the twentieth century, and in 2004 the city earned the “Ruban du développement durable” (the ribbon of sustainable development), a French award for local communities that effectively integrate sustainable development in all their policies. The city’s past is represented in its rich, varied architectural heritage combining late 19th century brick factories with buildings constructed on the basis of the principles of various twentieth-century architectural movements, Gothic monuments such as the famous 12th century basilica and contemporary constructions such as the Stade de France or the Magasins généraux d’Aubervilliers complex. This built heritage and social memory provides the context for the plans by architect Vincent Parreira and his studio AAVP for the new Casarès-Doisneau Intermunicipal School Campus, which the architects have nicknamed TINO. In this project architect Vincent Parreira reinterprets the town’s built heritage and social memory on the basis of the consideration that the decoration and quality of old-fashioned industrial buildings, and therefore the resulting spaces, have been lost in the collective memory. The architects reinterpret them and give the building contemporary value; every wall is decorated with motifs evoking the brick and metal structures characteristic of a factory, but the material used in both the frames and the finishes is actually wood. Using this noble, sustainable material, considered “soft”, the architects create inlay effects on the walls, exerting great control over every little detail. The building becomes a precious, solid treasure chest, with a series of openings for windows establishing the rhythm of the façade, evoking emotions and a sense of hope and promise for the future, which is, after all, the purpose of a school building. Casarès-Doisneau Intermunicipal School Campus consists of a number of buildings connected by walkways. In accordance with the studio’s way of working, each building has been given a short name, only three letters, so that, for example, ECO is the main building, the nursery school and elementary school containing 27 classrooms, while HAG contains the cafeteria and the gym and BAG is a utility area for the gym, while LOG contains the custodian’s lodgings, with a separate entrance. The two main buildings, ECO and HAG, are built on the basis of the same scheme, a structural wooden frame with a concrete base. ECO is a U-shaped school building located at the northern end of the site on Rue Henri-Murger, the volume of which bends to accommodate the old brick smokestack, which has been renovated and opened to the public. The HAG building is located on the opposite side, to the south, bordered on two opposite corners by the BAG and LOG buildings. The first of these has a metal frame and contains utility areas serving the gym, to which it is connected via an indoor walkway, while the second is the custodian’s home, with a wooden frame and cladding like the main school buildings. Book: Dans le pli d'un drapé - In the fold of a drape. Atelier d'architecture Vincent Parreira.